Please fill out the form below, and download the Catalog. We are the Electric Wire Rope Hoists Manufacturer, Supplier and Exporter in Ahmedabad,India who design unparalleled hoists. Our cranes come with flexible configuration which are made to suit the client requirements. We provide a range of hoists that are suitable for industrial and material handling uses. Our Electric Wire Rope Hoists can efficiently bear a weight of 1.0 tons – 20.0 tons. Ideally, our hoists come with a lifting range of 6.0 – 7.0 metres. However, we also provide custom design solutions for higher lifting capacities. All our hoists strictly adhere to the IS-3938 code of practice for design, manufacturing, erection & testing. We also provide up gradation services for your existing hoists. Ware house, Iron and steel, hydro-power, Power Stations, wind power sectors, paper, Chemical, engineering, automotive, Railways, Shipbuilding, rolling mills and many other types of industries, Coal Mines, Petro Chemicals & Chemicals, Oil, Mines & Rigs, Fertilizers, Solvent extraction plants, Paints & Varnish, Industry, LPG Bottling plants, Agro Chemicals, Drugs & Pharmaceuticals, General Industry. ➔ The most ideal and safe working load for these hoists is 500 kg to 20,000 kg. ➔ The lift heights are customizable as per client requirements. ➔ The duty class and standards of the crane are in strict adherence to the IS: 3938. ➔ The hoist speed is defined according to the specified requirements of the clients. ➔There are two options available for crane control – Either using a pendant push button or using radio remote control. 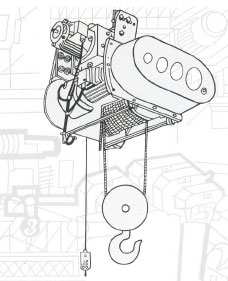 ➔ Our hoists come with a Squirrel Cage Induction Geared Motors drive system. They also have fail safe brakes for added security. 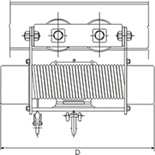 ➔ The Motor is of the Squirrel Cage Induction type with S4 duty. It has a speed of 150 starts/ hours and built-in fail-safe brakes. ➔ Hoisting and Cross Travel Motions are secured with EHT, AC/ DC shoe or Disc brake. ➔ The Hoists and Cross travel through are supplied with C.T. Power Supply System using trailing cables. ➔ The gear boxes of the hoists are of the Helical Type. ➔ By adjusting the I-beam size, the trolley can also be adjusted to fir the client requirements. ➔ We design our hoists to provide utmost efficiency and minimum losses. ➔ Specialised anti-friction ball bearings are used for all the high-speed rotation parts. ➔ The design of the hoists is such that makes every part of the Electric Wire Rope Hoist completely accessible and easy to maintain. ➔ Only a few of the parts of the Electric Wire Rope Hoists require maintenance. ➔ We follow strict and thorough examination of the Electric Wire Rope Hoists which ensures that they are 100% flawless. ☛ Rope Drum: We design the Rope Drums using flawless pipes and further secure them with grooves to ensure that the wire seating of the rope is perfect. ☛ Frame: To create the frames, we only use plates which are in accordance with the IS: 2062 standards, Gr A. The profile is duly finished and a boring machine is used to do the same. ☛ Gears & Pinions: Our gear and pinions are of the Helical type and are made using steel alloys. The material is further hardened to ensure to staunch design. The teeth cutting of the gears and pinions is done only after heat treatment to ensure smooth functioning. ☛ Bearings: The ball bearing used for the hoists are the heavy-duty ones and are used for all the rotating parts. ☛ Motors: The motors used are of the S4 type and have a speed of 150 starts/ hour. It is 40% CDF and has a design of Squirrel Cage motors in accordance with the IS: 325 standards. ☛ Rope guide: The rope guide is made using cast iron or mild steel. It is an easy to use and easy to dismantle part which guides the rope through the rope slides. ☛ Hook: The hook is made using forged steel according to the IS: 3815 standards. If required, we can also provide hooks according to the IS: 15560 standards. ☛ Brakes: The hoists and cross traverse are equipped with ACEM disc brakes. 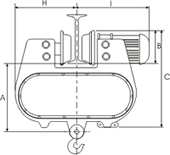 ☛ Limit Switch: For over hoisting, we provide the normal switch with roller design or rotary geared or counter weight gravity type switch. While for the cross travel and long travel motion, we provide two-way lever type switch. ☛ Trolley Adjustment: The trolley sizes are completely customizable according to client needs. We also provide the option of choosing a higher flange width. ⇛ All the parts accessories for our hoists and cranes are manufactured by Krishna Cranes. ⇛ We provide dedicated support 24*7 for all the equipments that we supply. ⇛ If required, we take up annual maintenance contracts (AMC) for your assistance. ✓ Our ensemble clientele includes many national as well as global companies. ✓ We have a well-defined and efficient system for sales and services. ✓ All our offices and warehouses are well-furnished and well-equipped. ✓ Only expert and qualified technicians are assigned the job of maintaining our sales operation system. ✓ Any minute, any hour, any day of the year, we are ready to provide assistance to you. I was skeptical before joining hands with “Hoist and Cranes” team about my recent construction. But they proved me wrong and delivered exceptional machines with expert supervision. Thanks and good luck to the entire team. Construction business is not a joke. Cranes and other construction related machinery play important part in this line. I am proud to have such a great team “Hoist and Cranes” working for my project. Till date I have not faced any issue with their machinery. Frankly speaking, I have experienced bad days with crane services in my previous projects. When I hired you guys I was really doubtful. But today, after the successful completion of the project, I really want to tell you guys that you will be there in all my upcoming projects. Krishna Crane Engineers is one of the leading hoists and cranes manufacturers in Ahmedabad, Gujarat, India. We export high-quality hoists and cranes with quick delivery and reliable services to Madhya Pradesh, Andhra Pradesh, Haryana, Karnataka, Rajasthan and Tamil Nadu. We manufacture & export hight-quality hoists and creanes across the world.